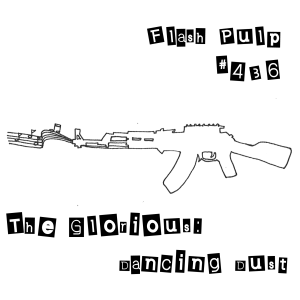 FP436 – The Glorious: Dancing Dust | Skinner Co. Welcome to Flash Pulp, episode four hundred and thirty-six. This week’s episodes are brought to you by Gatecast! Tonight we hear a tale of music and murder from the halls of Valhalla. Though there was no true end to Valhalla’s horizon, Leroy “Cutter” Jenkins had found himself at the western border of the day’s battle. The walls were cement and stripped bare by some ancient fire, and Cutter thought it likely he was hiding in a snippet of battlefront from some crumbling Eastern European warzone. Though the rooftops were alive with snipers, these lower middle floors, offering no view and little tactical advantage, had been left to gather dust in the lingering afternoon light. As he shuffled through the cupboards in search of any hidden discovery that might bring some novelty to his never-ending cycle of war and death, he became certain of an unfamiliar rhythm throbbing at the edge of hearing. This was not the rolling explosion of tank fire or landing artillery, nor the staccato of a heavy machine gun pinning down one of the day’s defeated. It was not the drum and fife of the marching, and it was not the chop of helicopter blades overhead. His ears had been so long drowned in the sounds of combat that it took his mind a full minute to comprehend the noise, and in so doing he was so surprised at its source that he spoke aloud to no one. “I’ll be damned if that isn’t rock and roll,” he told a box of cereal whose thick-charactered label he could not read. In seconds he’d entered the hallway with the look of a starving man stumbling towards a supermarket. There, however, he righted himself. The crack of a high powered rifle rolled through the shattered windows, and a half century of undying conflict sent his limbs into well-practiced maneuvers. At this more cautious pace, he pushed on. It took him ten minutes to find the door – one floor up, one apartment over. If he had been in any other position he might not have heard it, and now, as he considered the dark peep hole centered in the blank wooden face of the entry, the volume dipped noticeably. Was the entrance booby trapped? Was the whole thing a clever ploy to lure wanderers into an improvised explosive? Perhaps pushing through would set off a chain of detonations that would slide the whole building onto its nearby companion. Yet, with a sigh, Leroy settled on the notion that it was not his first death, and that he could not reasonably hope that it would be his last. He knocked – though after he moved to the leftmost side of the opening. It was Jenkins’ expectation that he would receive gunfire as a response, and, judging by the music’s sudden stoppage and the whispering that followed, it was a long moment before he could be sure it wouldn’t be the answer those inside chose. Finally, however, the entrance cracked enough to allow the barrel of an AK-47 to make an appearance in the otherwise silent hallway. He was running out of words to speak into the weapon’s mouth, and the suspicion that he had made a regrettable choice had begun to climb his spine, when the barrier swung wide. There were two women inside, their hair black and their eyes brown. “I am Leylo, and this is my wife, Feynuus,” said the nearest, the assault rifle in her hands steady and unerringly aimed at his chest. She wore a loose collection of flowing cloths whose mix of dark purples and deep blacks stood in sharp contrast to her companion’s bright yellows and scarlet reds. They seemed intent on reading his reaction to the welcome, and it was then that Jenkins deployed perhaps the reflex he had found most essential to survival in the endless churn of Valhalla: He smiled. Though Leylo hesitated, Feynuus was quick to return the gesture, and, before her defender might say otherwise, the woman turned and lifted a circular slab of plastic to an electronic mouth open and waiting between a pair of speakers. While the compact disc was something slightly ahead of his time of death, the unaging marine knew Saturday Night Rock ‘n’ Roll when he heard it. The waning afternoon light broke across the balcony and landed on the ugly green rug that dominated the living room. The legless couch and a pair of worn high-backed chairs had been pushed aside, to provide plenty of dance floor, and the sun seemed to luxuriate at having the full run of the space. Leroy had known such ugly carpets in his time – had dug his socked feet into a few with the woman who would become his wife – and so it was that everything foreign felt somehow familiar. Closing the door, Leylo lowered her weapon and moved to Feynuus’ side. Her finger danced across the volume knob, and the music dipped low enough to allow for conversation. Cutter, however, knew that his best chance came at leading that discussion. “None of the units I’ve been through had electricity,” he said. “Yes,” said Leylo, but nothing more. Decades of experience had left Leroy with the knowledge that his next question could go as badly as ending his day of living, being asked to leave, or being frowned at for being rude. It had also often been, however, the key to a understanding a new friend. In a place where no victory mattered, no wound lasted, and no loot followed you into the great dining halls once the crows cawed, such bonds were all he had found that might last. Leylo frowned, and her knuckles found a tighter grip on her rifle, but it was Feynuus who spoke. “I – I was married once before. Asad was a fisherman, and we carved an unhappy existence by the sea. He had little interest in me, and I had none in him, but it was what was expected and I was raised to keep my head covered and my eyes down. “When I was but eighteen, Asad gave his life to the waves. A storm took him, and his brothers, and I was abandoned with nothing more than a hut and a hungry belly. Praise all the powers that I did not also have a child to starve at my side. “Though I felt little love for my dead husband, there were few positions worse for a woman, in the town in which I was raised, than that of a widow. Those who were married wanted no reminder of tragedy, and those who were not had no interest in what they considered a failed and tainted bride. “There were few who might visit, and, once the condolences ceased, fewer still who might consider me friend. “I was left to fade away in an empty home, with an ancient CD player and a ragtag collection of discs that only served to remind me of a dead man. My days were spent in search of food, and my nights were spent in silent loneliness – that is, until my cousin, distantly departed to South Africa, sent on a small package. She’d heard of my position, and recalled my love of dance, and so had sent on some music she thought I might enjoy. Finally Leylo let slip a reluctant smile. “That is how I found her,” she said, “sweating from the heat of dance and a shut up house. I had never married, and was never afraid to speak my opinion, and this was too much weighing against me to be considered a member of the community – and yet I persisted. “By day I fished alone while laughing at the idea that it was a man’s work, and by night I sought the one who might join me in sharing my small, but earned, life. Feynuus giggled and set a hand on her lover’s arm. “Whatever the case,” answered Leylo, her fingers settling over those of her wife, “I knocked. I knocked, and we danced, and I went home at dawn thinking I had very rarely had so much fun. Cutter only nodded. He’d heard of a thousand rituals meaning the same thing since his arrival in Valhalla, and held no rites as lesser than his own. Feynuus nodded. “The warmth and passion that had always been missing with Asad burst forth from my heart, and I found it truly difficult to keep hidden. Yet, even my small joys seemed a hook to their eyes. “To their minds, worse than a widow was a happy widow, and even more contemptible than a happy widow was a woman who realized she was no widow at all. “On a Tuesday I attempted to purchase eggs from a neighbour, and found my meal lobbed at me with much cursing. On a Thursday the same man, a childhood friend of Asad’s, caught me out in the market and took to replacing his chicken’s spawn with rocks from under foot. “I was quick to retreat, but my eye was greatly swollen from a glancing blow. Leylo was little impressed when she returned. She worked hard to better my mood, but my feet had no strength that eve, and I spent a tearful night in her arms. “The next morning she rose before I did, and sought out Asad’s chum to have words. I’m sure she taught him some new ones, then she headed again to sea. “Likely her barbs sat ill with the fool all day, as, when evening fell, he knocked upon our door – and he was not alone. The crowd, no longer content to whisper, pulled me from the home they had previously coaxed me into, and dragged me through the dirt I had once shared with the corpse I could not love. “There were speeches, and proclamations, and threats – all, I can see now, intended not as a warning or lesson to myself, but simply as a righteous intoxicant to work themselves up to what they saw as the traditional solution – the only solution – for errant women such as myself. “With the sun setting at my back, and the dust before me dancing in reds and yellows under the churn of the mob’s feet, the first stone flew. “It seemed strange, then, to hear it so loud. It had always been a secret shared between us, meant to be kept low and in the dark, and yet here the drums rolled forth across the yard, and, as if under the influence of the keyboard and guitar’s fury, the door peeled wide. “There was my love, Leylo, holding her father’s otherwise useless inheritance. “The weapon had not been fired in years, but she knew its working – and the gathered murderers shortly did as well. Cutter had experience enough to know that even awakening in the Halls of the Glorious could not soften the memory of a traveller’s death, and he took a moment to inspect the balcony as the pair moved into an embrace. “A tough situation,” he said, his words bouncing from the closed door. “- and without a single one of those bastards in sight,” finished Leylo with a chuckle. Outside, the eternal staccato of combat continued, but inside, sweating from exertion and warmth, the trio heard only the thrum of their shared dance until the ravens called them to feast.